Learning French has never been cooler! This class develops children’s French comprehension and production through a variety of fun activities. In the process, students get to know the characters in their textbooks who will guide them through their language learning adventure! Our classes help children develop their skills in four key areas of language following the Common European Framework of Reference for Languages: speaking, oral comprehension, reading and writing. 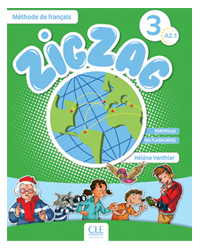 Our teaching methodology caters to different types of learners – whether visual, auditory or kinesthetic – through a natural learning cycle using structured and leveled activities based on the textbook Zig Zag by CLE International. 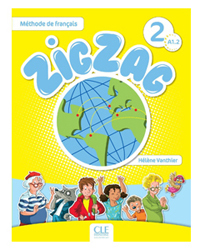 Children in our classes evolve from understanding new words and sentences in French with flashcards and memory games to producing them in a variety of contexts while gradually gaining independence and confidence through structured role plays. In the process, they get to know the characters in their textbooks who will guide them through their language learning adventure. With an emphasis on authentic communication, our task-based approach also helps children develop an understanding of the basic grammar and spelling of French. More than just learning a new language, they will interpret the world from a different perspective. 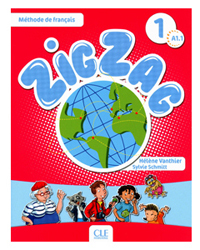 Zig Zag by CLE International.